Yesterday I used the example of different beings seeing liquid in a container to explain the views of attachment and anger on seeing an object, such as someone’s body. When you get attached to or angry with somebody, it doesn’t come from the side of the object. You get attached to or angry with something that came only from your mind, to an appearance that is projected by your mind. Yesterday, to clarify this, I used the example of how the same liquid in the same container appears differently to different beings in accord with the quality of the perceiver’s mind. To those with an impure mind, to those without any merit, it appears impure, as pus, blood and other unpleasant things. To those with a pure mind it appears pure, as nectar. To the pretas, who don’t have merit, it appears as only pus and blood. But when a human being looks at the same liquid at the same time it appears to them as water. When a worldly deva, who has more merit, looks at that same liquid in the same container, it appears as nectar. And, of course, for yogis and others who have pure appearance, and especially for buddhas, who have totally purified their holy minds, it appears as blissful, uncontaminated nectar. Therefore, you can see that your view is a production of your own mind, just as these different beings see different things according to the different qualities of their minds. There’s no such thing coming from the side of the object; there’s no such thing existing from the side of the object without depending on the mind. To put it in the shortest way: there’s no such thing from its own side. It’s all appearance. All the objects that you see also come from your mind; they are the result of the quality of your mind. This example is also very good to use in guru devotion and in respecting sentient beings. For example, even when you see a dog, the question is, “Is it a real dog or not?” Your seeing a dog doesn’t always mean that it is a dog. Take Asanga, for example. Before Asanga had purified his mind, he saw Maitreya Buddha as a dog. But after he had purified his negative karma by generating incredible compassion and sacrificing himself for that one living being, the ordinary, impure appearance of Maitreya Buddha as a dog disappeared. The same being that had appeared before as a dog now appeared as a buddha. You can’t really say who is a buddha and who is not a buddha. When you see a beggar or an animal, you can’t judge what they are from what appears to you. Saying “I see a dog” or “I see an ordinary being” doesn’t logically prove that it is a dog or an ordinary being. Until I am free from my evil karmic obscurations, even if all the buddhas descended in front of me, I have no fortune to see the holy body adorned with the holy signs and exemplifications – only this present appearance. We have no fortune to see buddhas in the aspect of buddha. We see only ordinary beings. The meaning of ordinary is having faults, delusions and suffering and making mistakes in actions. That’s the definition of ordinary, as His Holiness the Dalai Lama explained during the Guru Puja commentary that the FPMT requested as part of the Second Enlightened Experience Celebration in Dharamsala. Later, when I went for an interview, I mentioned to His Holiness that these words had benefited me very much. Until our mind is separated from karmic obscurations, even if all the buddhas came in front of us, it doesn’t mean that we would be able to see them as buddhas. We would see only ordinary beings with faults, or even animals. If you’re not sure whether a person or an animal is a buddha or a bodhisattva, your seeing them as an ordinary being with faults doesn’t prove that they’re an ordinary being. We definitely see buddhas, bodhisattvas and dakinis in our daily life in different places, especially in holy places. When we go to holy places such as the twenty-four holy places, there are numberless dakas and dakinis there, but it doesn’t mean that we recognize them. When we are in cities or on pilgrimage, we do meet holy beings, but it doesn’t mean that we recognize them. We cling strongly to our ordinary view, totally believing in it. Since we are habituated to our ordinary view, it blocks our seeing holy beings. Even if we see some special signs, it’s still difficult for us to believe that it’s a buddha and to really respect that being and behave toward them as it explains in the teachings. We don’t follow them or make requests to them. We certainly do meet buddhas, bodhisattvas, dakas and dakinis. It’s just that our heavy ordinary appearance and strong belief in our own view block our seeing that they are buddhas, bodhisattvas, dakas or dakinis. Because our mind is impure, our view of someone as ordinary doesn’t prove that in reality they are like that. Therefore, since anyone we meet could be a buddha, a bodhisattva, a daka or a dakini, we should respect everyone we meet. We should be careful not to get angry with or disrespect them, which creates heavy negative karma. By thinking that they might be a holy being, we should respect them and serve them, which creates so much merit. By thinking like this in our daily life, we gain a lot of advantages; we make a lot of profit, a lot of merit. The first thing is not to create negative karma, which is the obstacle for realizations and the cause of samsara, especially of the lower realms. When the mind is not purified, it sees beings as ordinary. The stories of Asanga and the novice monk Kusali are inspiring stories that show the benefit of generating great compassion and sacrificing yourself for even one sentient being. It brings the quickest, most powerful purification and collection of merit and enables you to quickly achieve enlightenment. Although these stories also illustrate the benefits of generating great compassion for even one sentient being, I’m using them here to show that our view of someone as pure or impure has totally to do with our own mind. It’s a production of our own mind, depending on whether the mind itself is pure or impure. The following story of Asanga is also helpful in relation to respecting sentient beings. After Asanga had spent twelve years in retreat on Maitreya Buddha, nothing had happened. It was only after he generated unbearable compassion and sacrificed himself to take care of a wounded dog that he was able to see Maitreya. The lower part of the dog’s body was an open wound filled with maggots, and Asanga cut flesh from his own thigh and stretched it out on the ground as somewhere for the maggots to live. Because collecting the maggots with his fingers might have crushed them, Asanga then closed his eyes and went to pick up the maggots with the tip of his tongue. But he found that he couldn’t reach them. When he then opened his eyes, he saw Maitreya Buddha. Asanga saw Maitreya Buddha not only as a dog, but as a wounded one filled with maggots. He saw something very awful. It is similar with us in our daily life. We can never tell whether in reality someone’s a sentient being just because we see them as a sentient being; they could also be a buddha. Even someone very ugly, awful or terrifying could be a buddha. Asanga didn’t see even an ordinary human being but a dog, and even that, a dog with great suffering. The other story is about Kusali, the Vajrayogini practitioner who went to the Vajrayogini pure land. Kusali’s guru, Krishnacharya, was going to the holy place called Oddiyana to engage in tantric conduct, the final part of tantric practice. It seems there are all different kinds of tantric conduct, in accordance with the individual person; there’s not one particular fixed conduct. Chöden Rinpoche said that one monk in Ganden Monastery who was about to achieve enlightenment and was engaged in tantric conduct built a huge house. There was no particular use for the house; he just built it. On the road to Oddiyana Krishnacharya met an extremely ugly woman riddled with leprosy and oozing pus and blood. No one would dare to touch her. She asked Krishnacharya to pick her up and take her to the other side of the river, but he didn’t pay any attention to her and went straight across the river. After some time, his disciple, Kusali, a monk living in thirty-six vows, came by and saw this leper. The woman asked him, “Please carry me to the other side of the river. Please take me there.” When Kusali saw the woman, he generated unbelievable compassion for her. Even though he was a monk and even though she was a leper oozing pus and blood, without any hesitation and with incredible compassion he lifted the woman onto his back. When he reached the middle of the river, she then appeared to him as Vajravarahi, not as an ordinary woman anymore. She then took Kusali, in that same body, to Dakpa Khachö, the pure land of Vajrayogini, where he became enlightened. Here, because of the unbearable compassion he generated for just one living being, Kusali completely sacrificed himself to take care of that being. This brought such powerful purification of his impure karma and defilements that, without crossing the whole river, when he reached the middle of the river, his view of that woman was only of a deity, Vajravarahi. She then took him straight to the pure land without his needing to die or go to the intermediate state or a next life. In that life, in that same body, he was able to go to the pure land of Vajrayogini. Here, Kusali seeing an ordinary leper was the view of his impure mind. By purifying the impurities of his mind, he then had the pure view of her as a deity. Another angle of this story is the importance of generating compassion as strongly as possible. The stronger you generate compassion, for even one living being, the quicker you are able to achieve enlightenment. I’m using these stories to help you to understand that all the objects that you are attached to or get angry with in your daily life are your karmic view; they all come from your own karma. They’re creations, productions, of your own karma. The view of things as ugly or undesirable manifests from your own karmic imprints, as does the view of any object of attachment. The view of something as desirable is also a creation of your own karmic imprint. It means that there’s nothing there from the side of the object, from outside. What we normally believe is totally wrong. When attachment, anger or any other delusion arises, we normally believe that it doesn’t come from our mind but from its own side. We think that the appearance of an object of attachment or anger exists from its own side or comes from outside, instead of thinking that it comes from our mind, that it is the view of our karmic imprint. The second point is that the appearance of this friend, enemy or object of attachment is the production of karma. It came from the karmic imprint, which means it came from your own mind. Again, there’s nothing from the side of the object. Now I want to tell you about the third point. The truly existent friend, the truly existent enemy, the truly existent object of desire, the truly existent harm, the truly existent help and so forth don’t come from their own side; they are projections of the negative imprints left on your mental continuum by past ignorance. This is the third point. There’s nothing coming from the side of the object, as we normally believe in our daily lives. It’s the total opposite. These three points give you an idea of how your view of an object comes from your own mind. It’s very important to do this meditation, this analysis, and use it in your daily life when you’re in danger of giving rise to delusions. It proves how delusion is a wrong concept because there’s no such object as it apprehends. In the case of ignorance, there’s no phenomenon that exists from its own side. Every phenomenon exists by being merely imputed by the mind in relation to a valid base. Because a valid base exists, that phenomenon is merely imputed by the mind. Therefore, nothing exists from its own side. No phenomenon exists from its own side; all phenomena are totally empty. That’s the reality. All these things appearing to us one after another as not merely labeled by the mind, as existing from their own side, are total hallucinations. They are totally false – not even an atom of them exists. This analysis proves that this ignorance that apprehends things as existing from their own side is totally wrong. It proves that ignorance is a false mind. And it is the same with anger, attachment and any other delusion: they are all wrong concepts. A superstition is something that you believe when in reality no such thing exists. So, all delusions are superstitions. 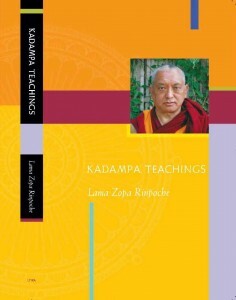 Excerpted from Kadampa Teachings, a new book freely distributed by the Lama Yeshe Wisdom Archive. Kadampa Teachings is a dynamic collection of teachings inspired primarily by the histories of the Kadampa geshes and their spiritual advice. 1 See Essential Nectar, p. 193, v. 121. 2 Published as The Union of Bliss and Emptiness. 3 Getsul Tsembulwa, in Tibetan. 4 Nagpo Chöpa, in Tibetan.